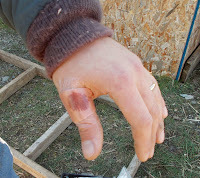 I am declaring our "stay-cation" a success, regardless of the doors still waiting to be finished, the duck house needing both sheathing and a roof, and the grievous injury to Sean's thumb. The barn roof is completely sheathed and tarped against rain, snow, and ice. The downstairs of the barn is nearly 90% complete- only wanting doors to be framed out and hinged. The garlic bed was tucked in with a nice 3 inch layer of straw to combat the winter cold. The piggie stall has been sheathed, a temporary door attached, and our resident piggies have made the move to the barn. 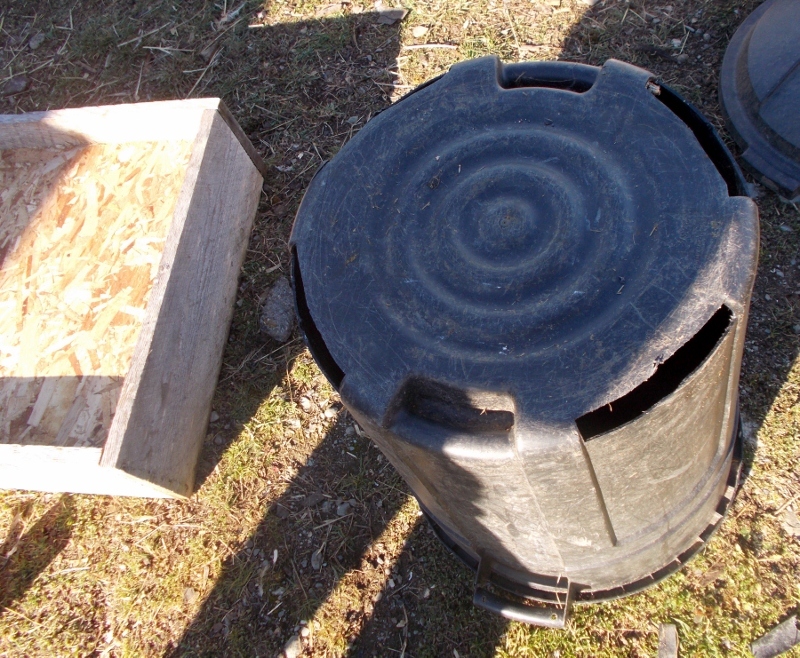 (READ HERE) A new gravity fed chicken feeder was constructed using repurposed material. I made another semi-successful batch of soap (which will be a post of its own in time). Plus!- We were invited to visit Wolfe's Neck Farm; Sean and I spent a lovely few hours there on Tuesday. Whew! The embedded video addresses many of the projects we completed over the long weekend. I want to focus this post on how we designed and built the new chicken feeder. I like it so much that we are going to duplicate it! 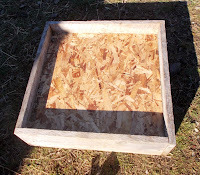 Wanting to use items we already had laying around, we designed it using the 30 gallon plastic garbage pail which already held the chicken crumble and a raised garden frame we were not using. First, Sean measured and cut 3 supports from some scrap 2x4's. He screwed these 3 inches from the top of the garden bed; 2 on opposing sides and one in the center. Then, he cut the OSB to size and slid it onto the 2x4 supports. We left this floating because it fit so snuggly. Next, Sean drilled 4 pilot holes in the bottom edge of the black plastic garbage pail, which we currently employ to store our bags of grain, scratch, and cracked corn. These were not large enough to allow enough grain to filter out and fill the box, so Sean began using a sharp knife to expand the holes. The knife slipped and Sean suffered a nasty cut across the base of his left thumb. He should have had a couple stitches, but bravely (read that despite my pestering) Sean soldiered on with only a band aid to control the blood loss until he finished our day's projects and finally allowed me reign to provide first aid. It wasn't until evening that I coaxed (read that bullied) Sean to sit still long enough for me to wash it thoroughly, apply some antibiotic cream, and butterfly the cut flesh back into alignment. 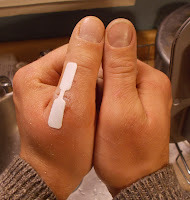 A large bandage across the entire wound to keep germs from getting in and causing an infection, finished my doctoring. Tonight his thumb is still slightly swollen and a little red, but there is no odor nor other signs of a serious infection brewing. Other than the paint splatters gracing his hand, it looks fairly decent. I will be watching it closely, though! While Sean was hastily bandaging himself inside, I carefully completed cutting the grain feed holes in the bottom of the garbage pail. (I did not see how badly he cut himself and assumed it was just a small scratch, since he said he didn't need help to put a band aid on it.) 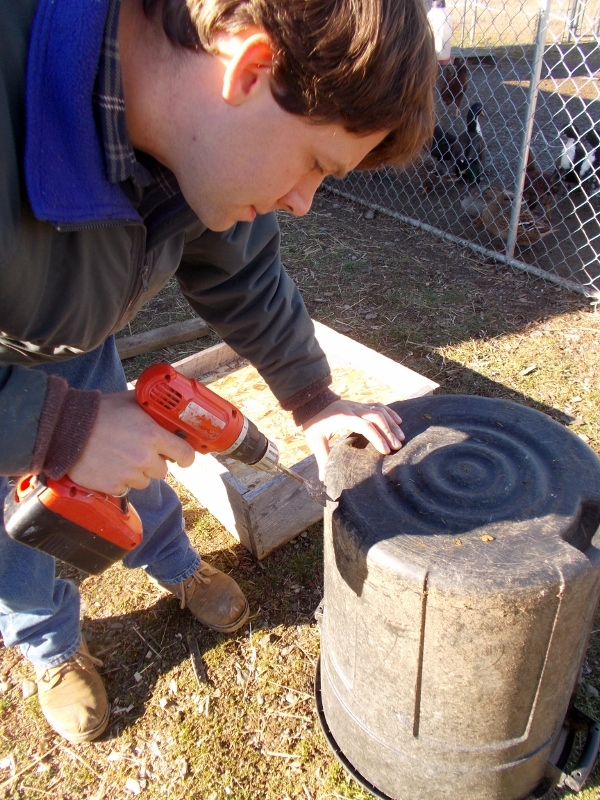 On his return, Sean drilled 2 small holes with the intention of through-bolting screws to attach the pail to the wooden base. I turned the pail right side up and placed it in the center of the frame Sean built. In a "happy accident" I set the pail directly over the support in the center. While this made it problematic to through-bolt the separate pieces, it made it very convenient to simply use two- 3 1/2" wood screws to secure the pail to the base. It may not hold permanently, but with Sean out of commission, we decided to try it out as is for now. A washer at the base of the screw head would have distributed the pressure better and I may make that modification in my next one. The chickens immediately surrounded the new feeder and in a frenzy ate their fill. Seeing the reaction to it, Sean and I worried that our feeder was not going to work as we wanted it to. We feared that the chickens would injure each other scrambling for food at the single station. We were concerned that they would gorge themselves and eat through 100 pounds of food in one day, which would be unhealthy for them and cost us a small fortune. Our concerns were unnecessary. Though the chickens ate for a little while voraciously, excited at the new food source. It look only a short time before, bored with it, they returned to sunning themselves, scratching in the dirt, or enjoying a dust bath. As the feeder is designed, it allows for an 8 foot circumfrance- 6 inches wide- of available feeding area. This can comfortably allow 16-18 birds to eat simultaneously. Since we have the material on hand to construct another one, we intend to do so this coming weekend. Thanks for visiting today. We're glad you came. We have plans to build a shelter for the feeder to protect against the rain/snow and solve the problem of spoiled feed, but that will be for another day. In the meanwhile, we will move the feeder inside their house when bad weather threatens. Even full, it only weighs @ 100 pounds, which Sean and I can manage. Great idea! I've made a really simple gravity type feeder for grit and oyseter shell, but never thought of doing this. I think I'd have to put it inside though--did I miss something major or...do you worry about the feed getting wet in bad weather? thanks! Good gooda moody you got a lot done!! I am sorry Sean got a boo boo, but it looks like you have done a fine job patching your love man up. Great job all around! Very clever! My only concern is rain getting in to the feed at the bottom. Ideas? Wow, you've been hard at work! Great job in getting everything done. I hope Sean's thumb heals soon - you did a wonderful job cleaning and bandaging his wound! We just viewed your video of the barn. It's amazing what you guys have accomplished using mostly recycled material and your own elbow grease! The barn looks a lot bigger at this juncture. Nice chicken feeder. The proof of the pudding is in the eating, and those chickens sure proved it works! We're very proud of ya'll.